There are no standard sizes in the pet industry, each dog is different and varies in size and build. Sizes are listed on each product description. Each manufacturer has their own sizing range for their own products so please be sure to check this. We have tried to give you as much information as possible to help you find the perfect fit. If you are at all unsure, contact us at info@swagandwag.co.uk and we will do our best to help you choose the correct size before you buy. BACK MEASUREMENTS – Measure along the top of the spine, in between the shoulder blades, where the neck joins the body, to the base of the tail where the tail joins the body. 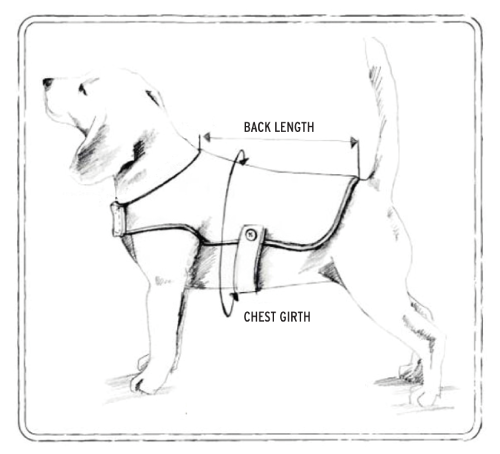 CHEST MEASUREMENTS – Measure around the biggest part of your dog’s ribcage. From just behind the shoulders down and around just behind the front legs and back up to the starting point. NECK MEASUREMENTS – Measure at the place where your dog’s collar would naturally rest. You need to ensure you measure a complete circle around the animal’s neck. For collar sizing the general rule is to take the dog’s actual neck measurement and add approximately 5cm (or 2 inches) to get your collar size. A properly fitting collar should allow you to slip two fingers easily underneath, between the collar and the dog’s neck. Bandanas and coats are sized according to the actual measurements of the garment, so unless specified otherwise in the listing, be sure to allow a bit of extra space for comfort. If any of your measurements are toward the larger end of the size range, you may want to choose the next size up. Also for heavy coated dogs, a larger size may be required, especially in the cold seasons when their coat tends to be thicker.